As an NHS GP I have been following the overdiagnosis movement over the last few years. I also have a growing (and somewhat conflicting) interest in lifestyle and functional medicine. Having recently finished my GP training I am well versed in evidence based medicine and informed choice, both of which are noble ideals that I agree with in principle. In practice, however, it can be extremely difficult to deliver. On the one hand the ‘evidence’ is far from robust, and on the other not all patients have the resources or motivation to take control of their own health and make what can be complex decisions. The advice women are given about the pros and cons of breast screening can be misinformed, and distorted by vested interest and bias.Women need to feel empowered to take control of their own health with reliable information and choice. Detecting signs of disease early is a good thing as long as investigations are not harmful and treatment options are likely to improve health and wellbeing. Because diet and exercise can reduce cancer risk, a ‘diagnosis’ or scare can be an opportunity for change to a healthier lifestyle. « Resilience and realistic hope for women with breast cancer » What really happens during birth and how can a doula help? 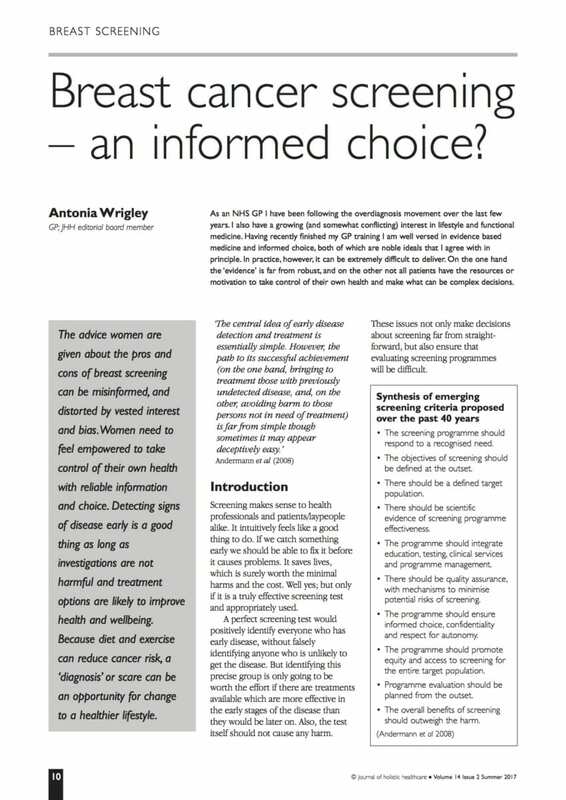 By Antonia|2017-08-07T10:41:03+01:00August 7th, 2017|Article|Comments Off on Breast cancer screening – an informed choice?